Even if you think you’ll never use it, there’s truly no harm in picking out a baby carrier for your little one to enjoy. Bonus points for a baby carrier that can eventually be used for your toddler too. When looking at two of the top options, the Infantino Go Forward Ergonomic Carrier vs. the Ergobaby Original Ergonomic Multi-Position Carrier, either one is sure to do its job for you. But at the end of the day, only one of them is going to be the better option. At first glance, both carriers look relatively similar to each other, but there are some stark differences. The most significant difference between the two by far is the cost. Infantino is generally a more affordable baby brand than many others, so naturally, the Go Forward carrier is also less expensive than the Ergobaby Original. The Ergobaby, on the other hand, a larger waistband which adds even more lumbar support. And that alone adds plenty of value to a carrier that will eventually be used to carry your toddler. Not only is your own comfort important, but it’s also plenty essential to make your baby’s comfort a priority when choosing between the two carriers. The Infantino may not look as comfortable for your little one as the Ergobaby, even if it’s equipped with the right amount of cushion. But the Infantino does hold your baby in without leaving room for him or her to dangle or shift forward. Whether you’re looking at cost, comfort, or longevity, both carriers certainly have their differences, and eventually, you’re going to have to choose between the Infantino Go Forward and Ergobaby Original. Facing in as an infant, facing as an older baby, facing out, and backpack. Front inward facing with and without the infant insert, hip carrier, and back carrier. Children from 12-45 pounds, or from seven pounds with the infant insert. It may be designed like most other similar multi-position carriers, but the Infantino Go Forward Evolved Ergonomic Carrier is more affordable and, for some, more comfortable. You can wear your baby in four different positions and in three of the four positions, your child’s legs will be in the hip healthy “M” position. This is necessary for healthy hip development and essentially a must when it comes to baby or toddler carriers. Since the carrier can be used with your baby from the time they’re a newborn, the little seat is adjustable as your child grows, which makes it easy for your child to continue to get use out of and stay comfortable. For teething babies, the carrier also includes a removable silicone teether and oft hood to keep them warm and as comfortable as possible. For your own overall comfort, the carrier has a thick waist belt to evenly distribute your baby’s weight and adjustable padded shoulder straps. 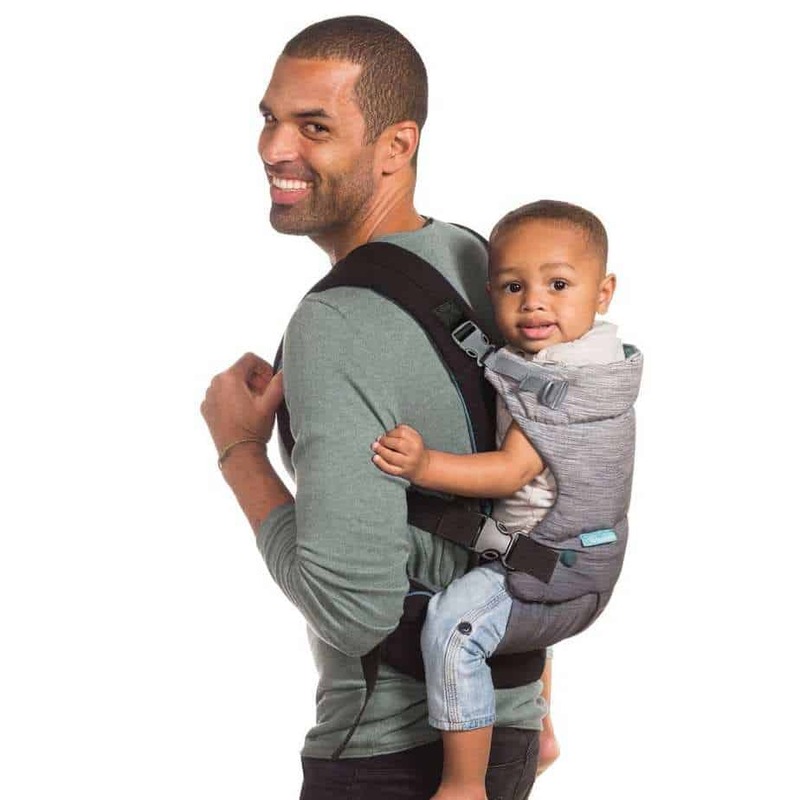 Positions: You can use the carrier facing in as an infant, facing as an older baby, facing out, and backpack. Child Weight Range: The Infantino carrier is designed for children from 8-40 pounds. Added Conveniences: There’s a removable muslin hood for your infant, as well as a detachable silicone teether that your baby can use even when he or she isn’t in the carrier. Price: On Amazon, the Infantino Go Forward Evolved Ergonomic Carrier is $48. Check out the latest price! Where To Buy: You can find it on Amazon or in-store at Walmart and Buy Buy Baby. Has This Item Been Recalled? : There are no current or recent recalls on the Infantino Go Forward Evolved Ergonomic Carrier. Compared to other similar carriers, it’s much more affordable. While the Ergo might make your baby’s legs feel almost too far apart, this one can feel much more natural. As your child grows, you can adjust the seat accordingly, giving your baby a comfortable and safe fit every step of the way. You can even use it as a backpack carrier, which can be helpful with bigger babies or toddlers. The material is relatively thick, so you or your baby may get hot after using it for a while. It can sometimes be challenging to get your baby comfortably seated in each position. There aren’t any big secure pockets or compartments to store little items like your phone, wallet, or keys. “I chose this carrier based on the fact that the forward-facing option offers an ergonomic (wide) seating position. In fact, the sliders to adjust the seat width for different positions are high quality, easy to use with color-coding, and lock properly (some Infantino models have sliding seat widths which cannot be locked).” – Dan Tee on Amazon. “I really appreciate the forward facing “seat” that unsnaps from the waistband and snaps to the body of the carrier to support baby’s hips. The adjustments are easy, and the entire carrier is not nearly as bulky as other much more expensive carriers.” – Kelly on Amazon. “Finally! A baby carrier my son will tolerate, and it’s Inexpensive! He absolutely hated the ergo carrier we bought. The Ergo forced his legs too far apart when front facing and he hates being shoved into my chest the other way. This Infantino carrier is perfect! His legs don’t dangle at all like other carriers, and he’s perfectly content front-facing!” – A. Kunetka on Amazon. “This is awesome. Similar to other expensive carriers I’ve tried on, but this one works great, and is less than half the price of other brands.” – T. Duffy on Amazon. Ergobaby has a lot of different options when it comes to carriers, but the Ergobaby Original Ergonomic Multi-Position Baby Carrier might be one of the more superior options. It has the ability to hold your baby in three different convenient positions that are all designed to keep your baby comfortable and safe as they grow. It also has an extra thick waistband for added lumbar support, along with padded shoulder straps that are fully and easily adjustable. For smaller babies or in case your baby wants to nap while seated in the carrier against your body, there’s also a privacy hood to protect them from harmful UV rays. For your own added convenience, there’s a storage pocket on the front, so it’s easily accessible. And like the Infantino, the Ergobaby allows your baby to be seated in the hip healthy “M” position, though he or she may find the position to be almost too wide for their comfort, depending on your child. Positions: You can use the carrier as front inward facing with and without the infant insert, hip carrier, and back carrier. Child Weight Range: The carrier is designed for children from 12-45 pounds, or from seven pounds with the infant insert. Added Conveniences: It has an extra large storage pocket on the front for easy access. Price: On Amazon, the Ergobaby Original Ergonomic Multi-Position Baby Carrier is $119. Check out the latest price! Has This Item Been Recalled? : There are no current or recent recalls on the Ergobaby Original Ergonomic Multi-Position Baby Carrier. The carrier is designed to put the weight on your hips rather than on your back or shoulders when carrying your baby in it. Since it’s made from a canvas material, there’s less of a chance of the carrier ripping over time. The front pocket is so roomy that you may not even need to bring a purse when out and about with the carrier. The straps provide extra padding and comfort that some other carriers do not. The buckle that snaps on the waistband can sometimes come unfastened on its own, which can be an inconvenience if you don’t realize it. Some little ones might find the seat uncomfortable in their legs after sitting in it for a while. Although one of the positions you can use with the Ergobaby is the hip, it can feel a little bulky when trying to use it that way. “I bought this baby carrier for my daughter and her husband. This is their first baby. My son in law is a big man, and it was hard to find a carrier that worked for him. The Ergobaby is the first one that we have been able to find where the straps were long enough for him. He has always wanted to be the one that carries him when they are out and now he can with ease.” – Bruce Mason on Amazon. “Our two almost three-year-old daughter wants to be carried in large crowds all the time. We tried on a friend’s ergo baby, and she loved it- didn’t want us to give it back. We used ours at the zoo and the fair last week, and we all loved it! Easy to get in and out. She felt safe and comfortable.” – Jennnifer M. Davis on Amazon. “I got this at a great price and even better than that, my four-month-old son loves it! He immediately lays his head on my chest when I put him in it, and he is so content. I love not having to lug his heavy car seat everywhere.” – Melissa Edmunds on Amazon. “Best carrier by far. My husband and I both use it, and it is easily adjusted for our different body types. Fits comfortably distributes weight evenly, and baby seems comfy and happy in it. We started using it as a newborn, and he is 19 pounds and still works perfectly. Love this carrier!” – Cindy Suazo on Amazon. On paper, both carriers might seem reasonably similar to each other with very little differences. But comfort and cost are key and in both areas, the Infantino Go Forward Evolved Ergonomic Carrier is the way to go. Not only is it more affordable than the Ergobaby Original Ergonomic Multi-Position Carrier, but it also offers more comfort for your baby. The ergonomic seat is sure to keep your baby comfortable and keep their legs in a proper “M” position without overstretching them. Because of the way the seated position might make your baby’s legs sore after a while, the Ergobaby just doesn’t cut it in this instance. Overall, it’s still a solid carrier, but when compared to the Infantino, it just doesn’t measure up enough. A multi-position carrier is always useful, regardless of which brand you prefer to go with. Even if you’d rather spend more money and chance it with the Ergobaby this time around, you’re still likely to get plenty of use out of it. It still offers different positions to try out, and every baby is different in their preference and comfort levels. At the end of the day, however, the Infantino is the stronger option in this instance. You just can’t beat the value and longevity that it offers as well as overall comfort for both you and baby. But when it comes down to it, getting a baby carrier at all is a smart move for any parent. Joovy Zoom 360 vs. Bob Revolution SE – Which is the Best?